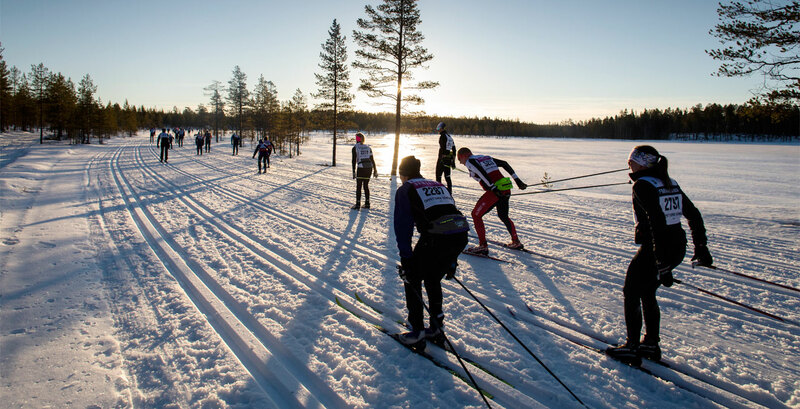 For the tenth year in a row Vasaloppet had over fifty thousand participants who managed to complete their Winter Week races. This year 51,878 (counting all five team members in Stafettvasan) reached the finish in Mora. They skied a combined three million kilometres! 3,135 participants broke off their races and in total there were 62,951 registered participants, counting 591 participants in the Barnens Vasalopp children's ski race. – Ten races over ten days attracted 62,360 registered participants (excluding Barnens Vasalopp on skis) from 64 nations. To give an overview of this past decade there were 65,955 registrants in 2018, 66,582 in 2017, 68,024 in 2016, 67,126 in 2015, 67,435 in 2014, 66,212 in 2013, 63,142 in 2012, 59,161 in 2011, 57,560 in 2010 and 48,184 in 2009. – 55,013 started and 3,135 broke off their race. This means that there were 793 fewer participants than in 2018 but at the same time a lot more people aborted their races in 2019 compared to the previous year, which can be explained by the weather, which was significantly worse than its been for years. 2,158 broke off from Vasaloppet which is 14.6% of the starting participants. That’s the fourth highest in Vasaloppet history. 51,878 reached their finish (including the five Stafettvasan sections), making it the tenth year in a row that over 50,000 participants crossed the finish line. – Those who finished their races skied a combined 2,908,145 kilometres! That’s equivalent to about 75 laps around the Earth, 536 laps around Sweden’s border or a total of 32,312 Vasaloppet! – 12,559 finished in Vasaloppet which means there have now been 588,179 Vasaloppet finishes throughout history. On March 1, 2020, 499 years after the first Vasaloppet, we will in all likelihood see the 600,000th participant ski their way up Vasagatan to their Vasaloppet finish. – About 37 percent of the starting participants in Vasaloppet’s Winter Week were women and 63 percent were men. Vasaloppet had 16 percent women and 84 percent men. The average participant age was 40.4 years. – 90 percent of participants came from Sweden and 10 percent from the other 64 nations. The record number of participating nations is 69 (2018). – A total of 8 skiers were punished in Vasaloppet for unauthorized skiing techniques. Ten or so participants were given a 15 minute time penalty due to littering. Vasaloppet can state that there was very little littering in the track in all races. Abundant snowfall in Vasaloppet made it difficult to monitor for littering but a plan is already in place to clean up the track as soon as it’s possible. – Nine track machines created new tracks during Vasaloppet to improve the track quality in the porous snow that fell during the day. – 200,000 Vasaloppet buns were baked by Rättviksbagaren in preparation for Vasaloppet’s Winter Week and some of the last buns to be handed out were turned into semlor in the home of a happy Vasaloppet participant some days after the race. – On average the five-hour Sveriges Television Vasaloppet broadcast on March 3 had 1,850,000 viewers, the highest number since 2014. In total 37.0 percent of the population (3,600,000 viewers) watched at least three minutes of the live broadcast! When the race was summed up in Mora (after the World Championship broadcast from Seefeld) and the recreational athletes came into focus with interviews in Evertsberg, in Oxberg and by the finish – 861,000 viewers on average were still in front of the TV, following the two-hour broadcast. – Broadcasts on SVT Play with skiing reporter Mattias Svahn had about 182,000 stream starts and the main SVT Play broadcast had 130,000 stream starts. – Tjejvasan, which was live broadcast from start to finish for the eighth year in a row, was seen by 454,000 people tuning in to some part of the broadcast. – Vasaloppet’s own streaming service www.vasaloppet.tv with live streams, clips and finishes, had a total of 250,424 viewers during the Winter Week. – 121,000 results were monitored through the Vasaloppet app. – Three different nations took home the top three spots in Vasaloppet’s Winter Week. Swedish cross-country star Britta Johansson Norgren won both Tjejvasan and Vasaloppet with compatriot Lina Korsgren coming in second and Czech Katerina Smutná coming third in both races. In the Vasaloppet men’s class Norway scored a triple with Tore Björset Berdal, Stian Hoelgaard and Torleif Syrstad coming first, second and third. – Britta Johansson Norgren won six of the seven spurt prizes at the official Vasaloppet checkpoints. Katerina Smutná came just ahead of Britta in Smågan. The spurt prize (Hill Prize) is 10,000 SEK in Evertsberg and 5,000 SEK in Smågan, Mångsbodarna, Risberg, Oxberg, Hökberg and Eldris. In the men’s class Olle Jonsson won the first two spurt prizes and the following prizes were won by Johannes Eklöf (Risberg), Stanislav Řezáč (Evertsberg), Andreas Holmberg (Oxberg), Morten Eide Pedersen (Hökberg) and Petter Eliassen (Eldris). – HRH Prince Carl Philip skied Vasaloppet with a time of 8.46.12 which can be compared to HRH King Carl XVI’s Vasaloppet time of 8.12.41 in 1977. But the family record is still in place from when Prince Carl Philip completed Öppet Spår in 2004 with a time of 6.21.52, comparable to King Carl XVI Gustaf’s personal best result from 1987, 7.09.45. – Some other high profile participants who crossed the finish line in Vasaloppet’s Winter Week 2019 were former Minister for Culture Alice Bah Kuhnke who completed the race with a time of 12.02.02. Another former minister who completed Vasaloppet was former Minister for Justice Thomas Bodström who finished with a time of 11.23.34. Adventurer and inspirer Aron Andersson, participating with sit-ski, finished his fifth Vasaloppet with a time of 9.30.44. Celebrity chefs Melker Andersson and Paul Svensson both had impressive times, passing the finish at 8.10.20 and 7.27.09 respectively. Triple World Championship gold medallist in curling, Peja Lindholm, skied across the finish line with a time of 9.10.12 and hockey coach Mats Lusth completed the race with a time of 10.28.26. – Fastest 50-year-old (H50) in Vasaloppet 2019 was Per-Olov Svahn, Boxholm, in 96th place with a time of 4.59.13. Fastest lady in D50 was Catharina Ramhult, Ulricehamn, in 48th place with 6.25.23. – 1,926 men and 118 women got medals in Vasaloppet. Those completing the race in the winning time plus 50 percent receive the medal. The medal time in 2019 was 6.58.53 for men and 7.21.37 for women. – 3,327 participants completed Halvvasan. These participants have a shot at Vasaloppstrippeln 45 if they complete Cykelvasan 45 and Ultravasan 45 this summer. – About 3,000 functionaries made all this possible – a big thanks to all of them! Sponsorship quotas and late registrations can sometimes make the actual number of participants higher than the official maximum number off registrants. Fri 21 Feb: Kortvasan. 30 km. Start Oxberg. Sat 22 Feb: Tjejvasan. 30 km. Start Oxberg. Sun 23 Feb: Ungdomsvasan. 9/19 km Start Eldris/Hökberg. Sun 23 Feb: Öppet Spår Sunday. 90 km. Start Sälen. Mon 24 Feb: Öppet Spår Monday. 90 km. Start Sälen. Tue 25 Feb: Halvvasan. 45 km. Start Oxberg. Fri 28 Feb: Stafettvasan. 9–24 km. Five-person teams. Start Sälen. Fri 28 Feb: Nattvasan 90. 90 km. Two-person teams. Start Sälen. Fri 28 Feb: Nattvasan 45. 90 km. Two-person teams. Start Oxberg. Sat 29 Feb: Blåbärsloppet. 9 km. Start Eldris. Sun 1 Mar: Vasaloppet. 90 km. Start Sälen.